Racist Baltimore Police Regime Racial Terrorist H.R. Persuhn’s TERRORIZES black shopper John Holt in department store: “GIVE ME YOUR ID , I THINK YOU HAVE A WARRANT.” WTHF? Fire that white devil! #whitepoliceRracialterrorists! #fuckPersuhn! judge Joseph J. Bruzzese Jr.
Mecklenburg County Black Foot Soldiers statement. Sergeant Ervin Romans & Sergeant Daniel Sakai DEAD! The Divine Racial Karma Killing of Reparations Offender Rhonda Hambright! The Nathaniel Ewing Reparations Protest! The Shane Varnadore Reparations Protest! 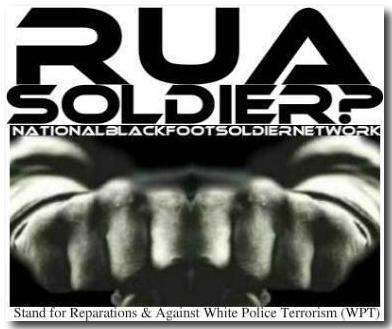 The Thomas Childs Reparations Protest! Trans Atlantic Slave Trade Holocaust denial! (BREAKING UPDATE!) "I’LL BE HIM!" Black Foot Soldiers Around Nation Volunteer to be Brave Activist Forced to Defend Self Against Vile Reparations Offender Marley Lion! Charleston County Black Foot Soldiers have issued a statement condemning the life of seventeen year old reparations offender Marley Lion. Lion, according to white media, was shot multiple times early Saturday morning in a sport utility vehicle he parked off Savannah Highway because he felt as though he’d had too much to drink and wanted to go to sleep. He was a 2012 graduate of Academic Magnet High School. “Marley had just graduated from a prestigious magnet high school and surely had an American history course. “Surely this budding racial terrorist learned of the Trans Atlantic Slave Trade (TAST) and the near century of open racial terrorism ours endured at the hands of his in the post TAST era. So this drinker of his fore-fathers’ wines also knew of and accepted his kinds’ tyrannical refusal to make restitution for TAST crimes. “Infact, this budding white supremacist was ready to go in the direction of the majority of America’s self deluded whites and live his piggish life voting in American elections as a Democrat or a Republican and paying race based taxes that only perpetuate the system of institutionalization against our people. According to Chester County Black Foot Solder Chester Banks, however, Lion’s ‘bright future’ was afforded at the expense of the lives millions of Africans, Native Americans and Mexicans who cultures were victimized by Western imperialism. “Marley Lion’s so called ‘bright future’ was soaked in the unrestituted for sweat and blood of millions of Africans, Native Americans and Mexicans whose peoples and cultures were all brutally victimized by Lion’s forefathers. The Marley Lion Reparations Protest; Charleston County Black Foot Soldiers Condemn 17 Year Old Reparations Offender Who "Apparently Turned Protest Violence," Praise Coura-geousProtesters Who "Stood Up Against Lion’s Racist & Narcissistic Denial of Reparations."